A New General Map of America Drawn from several Accurate particular Maps and Charts and Regulated by Astronomical Observations. 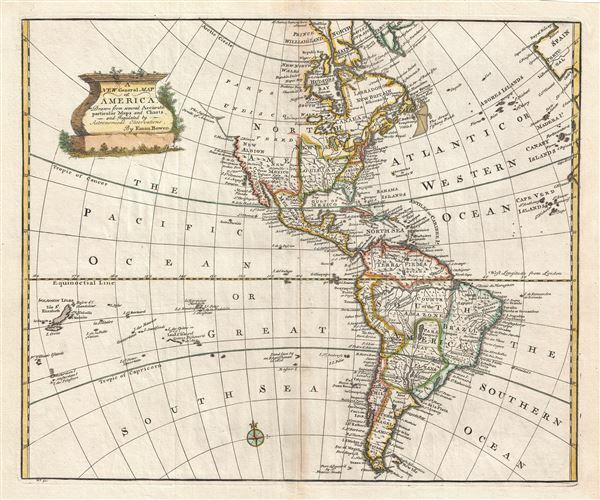 A stunning 1747 decorative map of the Western Hemisphere by E. Bowen. Covers North and South America as well as much of the Pacific and the Atlantic as far as Spain and the Canary Islands. Details America during the Colonial Period. In North America, England controls the colonies along the eastern coast of the continent and surrounding the Hudson Bay. France occupies Louisiana, parts of Canada, and the Great Lakes region. Spain controls the western part of the continent as well as Florida, Mexico, most of the West Indies and, with the exception of Portuguese Brazil, all of South America. Most of western North America is unexplored though Bowen does name several known points along the coast, including the Bay of the Conception and Cape Mendocino. He also notes Drakes Port where Francis Drake laid claim to New Albion for England in 1579. Though the true location of Drakes Port is the object of considerable debate, most associate it with Pelican Bay on the border of California and Oregon. 'The Pelican' was Francis Drake's ship and the bay is named after it to this day. Further north the coastline becomes speculative, though the 'Supposed Straits of Annian' are noted. The Straits of Anian are said to be the entrance to a Northwest Passage discovered in the 16th century by the apocryphal navigator Admiral de Fonte. Inland, near the northern tip of Baja, Bowen draws Great Teguayo, one of the Kingdoms of Gold presumed to be found in the unexplored American west. Teguayo first appears in the Benevides Memorial, where it is described as a kingdom of great wealth to rival Quivara, another mythical kingdom which curiously does not appear on this map. The idea was later popularized in Europe by the nefarious Spaniard and deposed governor of New Mexico, the Count of Penalosa. Originally Teguayo was said to lie west of the Mississippi and north of the Gulf of Mexico, but for some reason, Bowen situates it further to the west. In the same part of the world, Bowen also maps the Rio Grande, or the North River, as a rival in magnificence to the Mississippi itself, extending north well into Canada. North of Lake Superior Bowen adds another enormous lake, easily rivaling the Great Lakes themselves in its majesty. Though labeled Assempolis Lake, it most likely represents the Lake of the Woods. This area was being actively explored in the early 18th century by French traders with hopes of discovering a river route to the Pacific. Though no such route was ever found, many believed that rivers leading west from the Lake of the Woods would empty into the Pacific or even a great inland sea called the Sea of the West. Bowen clearly a cautious cartographer, does not speculate on the unknown. South America is well mapped with numerous Amazon tributaries noted. Bowen includes the apocryphal Lake of Xarayes as the northern terminus of the Paraguay River. ' Xarayes' is a corruption of 'Xaraiés' meaning 'Masters of the River.' The Xaraiés were an indigenous people occupying what are today parts of Brazil's Matte Grosso and the Pantanal. When Spanish and Portuguese explorers first navigated up the Paraguay River, as always in search of El Dorado, they encountered the vast Pantanal flood plain at the height of its annual inundation. Understandably misinterpreting the flood plain as a gigantic inland sea, they named it after the local inhabitants, the Xaraies. The Laguna de los Xarayes almost immediately began to appear on early maps of the region and, at the same time, almost immediately took on a legendary aspect as the gateway to El Dorado. The South Pacific portions of this map contain numerous islands, some of which are real, but most of which are difficult to associate with any actual islands. The Solomon Islands are drawn wildly out of proportion to their actual size leading to speculation that they may have been confused with nearby New Britain. Also names several other uncertain island groups including several islands, labeled Quiros, supposedly discovered in 1603. Notes Easter Island, which was discovered by Davis in 1686, as well as a mysterious land to the north supposedly sighted by an English pilot in 1636. This bit of land appears uncannily like Davis' Land, which does appear in other maps of the period and which most now associate with Eastern Island. Given the date and the lack of evidence of another English pilot in the region during in the 1630s, we speculate that the engraver of this map must mistakenly substituted a 3 for an 8. Very good conditon. Original centerfold. Mild overall toning. Old printing crease through southern Greenland. Blank on verso. Rumsey 3733.050. Phillips (Atlases) 603-51. Shirley, R. W, Maps in the Atlases of the British Library, T.BOW-2a, #51.